You can find some really good art....everywhere but here. I am entirely irresponsible for everything that you are about to see. If I am in any kind of way responsible for it, read the second line of this again. I'm so sorry, guys. xD But I meant everything I said. No drawing skills here. HOWEVER! I obviously didn't just cut the comic off and be done with it, waaah. That's not my style. Nothing makes sense by the way, neither the way nobodies are born nor the diddlying timeline, but hell if I give a dayum right it's all for the fun muhahaha. It was a perfectly normal day in the Headquaters of Organization XIII. Translation: It was a horrible day for SaÃ¯x. All things considered, it had started quite uneventfully. He had given everyone their orders for the day and checked the current status of Kingdom Hearts (as frequently as possible! !, as Lord Xemnas had ordered him to). 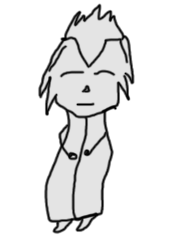 But as absolutely always, there had to be this one thing that screwed everything over, and, also as absolutely always, it had obviously, naturally been Demyx who had messed things up. SaÃ¯x suppressed the urge to let out all the things he felt like saying in return, and just turned at the person in front of him. Hooded, like all of them, and honestly weirdly small. A kid? No, that didn't quite catch it. Times like these, SaÃ¯x questioned his life choices â€“ every single one of them â€“ and wondered if Kingdom Hearts was worth all of this trouble. Of course it is, he told himself. It has to be. But looking at the small figure in front of him, he wasn't so sure anymore. In what kind of world did this body shape make sense? Was it even a person, or some sort of Mecha robot? â€œYooo, what's your name, new one? Mind if I call you SaÃ¯x's new plaything? It's a running gag, so don't think too much into it. All of SaÃ¯x's luck as for this day considered, that was probably true. Staring and longing to kill him for whatever reason. The last thing SaÃ¯x heard before he left through a corridor of darkness came from their newest member. I need a break. That were the only words he had in mind for his superior. 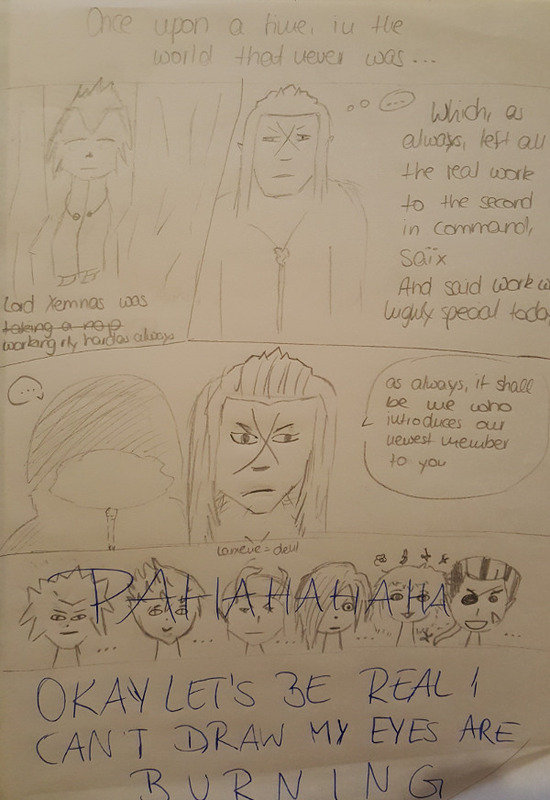 After all that had happened throughout the last weeks â€“ Demyx bringing a (very aggressive) cat to the castle for no reason whatsoever, Larxene blowing up part of the meeting room because Axel had made a joke on her cost, or, Kingdom Hearts forbid him to even think about it, the obscure creature Vexen had created out of sheer insanity â€“ SaÃ¯x was officially on the edge of insanity himself. There was no possible way that Lord Xemnas could forbid him this dearly needed vacation. If needed, he would gather enough missions for the others for a week straight, only so he wouldn't have to see them for a while. Unsurprisingly enough though, things didn't seem to feel like going SaÃ¯x's way. At all. He had merely finished the sentence before he noticed that his superior wasn't longingly staring at Kingdom Hearts, even though that was what it looked like, but was in fact â€“ and no one would believe that ever, understandably â€“ sleeping. Staring at the damn moon and leaving all the work to SaÃ¯x was apparently very tiring, but enough was enough. SaÃ¯x needed this break. And he would get it. He would never say it out loud, but upon returning to the castle one week later, he couldn't deny that there was hardly anything he would like to do less. In times like these, he missed the carefree days in Radiant Garden, even though he was not supposed to think something like that â€“ and seeing Axel play idyllic world with his new best friend only assured him of that even more. Oh well, it didn't matter. The vacation had reminded him of why this work was so important. Why they needed to hurry in order to complete Kingdom Hearts as soon as possible. He would get back to work, with things being as stressful as usual, but in no way out of the ordinary. What greeted him in the meeting room of the castle was everything â€“ but not the ordinary. He counted thirteen cats in the room, out of which seven immediately tried to climb on him, however redecided when they saw his deadly gaze. In the shadows, caused by someone â€“ Larxene â€“ having destroyed the lighting in the room, somewhere in the middle of the room where he expected the sofas to be, there was...a tent? Considering he heard childish giggles from inside, he already knew who was responsible for that. It was a disaster. And he was a second from turning all of these imbecils into dusks on his own! One of the cats jumped on him and scratched his face, as if the scar he already had wasn't bad enough. He needed another break. This was ridiculous and, by all means, disrespectful to all of them as an Organization formed to achieve a very high, very important goal. The worst part was that the grown-ups, instead of taking his place and bringing order to the group, had seemingly just vanished into thin air. All of this was terrible. He already started talking while walking up to his superior. By all means, SaÃ¯x did have respect, but as of now, he was unsure what to think of this situation and worried about their progress and their future. Nothing about the scenery in front of him felt quite right. Nothing. There he was, Lord Xemnas; sitting in front of the moon instead of staring. That was alright, even though highly uncommon, but standing here for hours or days was surely tiring, so SaÃ¯x didn't think anything of it. He did however think something about the person sitting right next to the superior, dressed in a fancy outfit and definitely the fanciest hat SaÃ¯x had ever seen, staring at Lord Xemnas as if the sun had risen in this world of darkness. This is the moment I should turn around, go to bed and only wake up when things have changed. Not a single second earlier. It was a comforting idea â€“ so he couldn't do it. Someone, he thought. Can he be serious about this. He didn't specify, because it was obvious who he was talking about. He also didn't care that the person heard him, and neither did she. â€œFudge!â€ she replied, weirdly enough not seeming to mind the weird nickname, and without even giving SaÃ¯x a single look. There was something in the deep tone of Lord Xemnas's voice that made the woman look like she would faint from amazement any second, and SaÃ¯x feel as if he would faint from utter disbelief. He didn't even take the time to roll his eyes before leaving. He stopped for a second, as he couldn't believe the positivity in these words. He felt like he hadn't heard anything nice from Axel in, what, ten years? He already started walking again, however Axel seemed very determined to get him to help, as he actually caught up and grabbed SaÃ¯x by his arm. The redhead didn't get to finish the sentence, as in that very second, something that SaÃ¯x would most likely neither forget nor believe ever in his life happened. Rumbling down the â€“ until now â€“ perfectly white and pure stairs of the castle came a kart. But that wasn't even the worst part yet. The kart, quite obviously driven by their newest member, came straight for them. Was this the moment SaÃ¯x should dodge? He considered not doing it, as ending his terrible life sounded like the most rational thing he could do right here. To his surprise, the kart actually passed him by, at a speed you wouldn't believe, and the driver had the audacity to throw a foul, stinky banana peel at SaÃ¯x. As of this moment, the second in command couldn't have begged more for the kart returning and running him over. â€œCastle Oblivion, now,â€ he demanded without even looking at Axel, and disappeared in the darkness with the not-so-sweet voice of their newest member in his ear. "I"M NUMBER ONE! Heh, hehehehe! Look, I'ma dance, I'ma Sing, I'ma so Happy! HA, hahahahaha!...Heh? Grrrrrrrrrrrrr!" Axel appeared right next to him in front of the capsule room, not even a second after SaÃ¯x did. And with the tone in Axel's voice, the bidding, the apologetic grin he wore, SaÃ¯x was sure that was true. ...Oh how he begged he hadn't. NaminÃ© was there alright. No problem about it. Sitting in her chair in front of the capsule holding Sora, watching over him, probably busy drawing her weird fanart of him. It was a creepy hobby, and SaÃ¯x held no wish to understand it. But there was someone else right next to NaminÃ©, urgently talking to the girl as if giving her orders, and from what it looked like, it weren't orders SaÃ¯x would approve of. She winced, jumped up and turned around with an apologetic look. SaÃ¯x really didn't want anything to do with this weird fanart fetish-thing NaminÃ© had, and now with not only one, not two, but three intruders in their Organization, he finally snapped. Oh well, guess what? He didn't quit. Of course he didn't quit. After hours of debates, discussions and even downright begging to be turned into the smallest, most pathetic kind of dusk the worlds could ever see, SaÃ¯x found himself standing at the very same spot as always, waiting to give out today's missions. The day had been pretty good so far. Their newest official member â€“ Waaaah-Luigi!, as he had learned â€“ had only crashed into seven different kinds of furniture today â€“ a truly remarkable performance by all means. The two girls, who had for whatever reason gotten the permission to stay with them â€“ â€œmaybe they're witches, tooâ€, SaÃ¯x feared, but decided not to even try logical thinking here â€“ were busy squeezing the shop moogle at the other end of the room, discussing their matters so loudly that SaÃ¯x wished he were deaf. â€œHey, grumpy!â€, the blonde suddenly screamed at him, sadly not risking an early death as she seemed to have a free-pass for everything. It was in that second that some weird of very weirdly shaped, blue, turtle-less turtle-shell came flying in SaÃ¯x's direction, leaving him questioning every single one of his life choices yet again, when it exploded right in his face. It's noted. Whenever I get something else done that's equally good, you'll be the first to see it. and also this now is MPX - Most Precious Xemnas and will be licked loved! Looking at MPX causes me physical pain errr I mean pleasure of course. How nice to look at. BY THE WAY I'M GLAD YOU SURVIVED IT. Oooohhhhhhhhhhhhhh, don't worry. You see, Germany seems to have a thing for being split ( Í¡Â° ÍœÊ– Í¡Â°), and we take it so far that there are even groups of people who choose a band over a specific other one. With Tokio Hotel, you somehow either liked them or US5 back in the day. Yeah, don't ask. It's weird. Anyway I never liked US5 over all, but I was a diddlying freak for Tokio Hotel. I may or may not still listen to one or the other of their songs, so don't worry, you're a-okay! Isn't this guy Tom Kaulitz?? I was having such a good laugh thinking about such a superstar fail tattoo !! Oh my god LOOOOOOOOOOOOOOOOOOOOOOOOOOOOOOL no it's not. I seriously do not have any words to describe how much I loved this!